Principle refers to the People’s way of thinking. It is also called mindset. 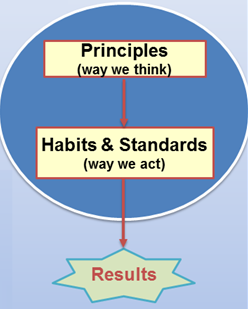 These Principles are the starting point for Kaizen (Changing for the Better) and are embedded in all the tools; they form the very foundation on which the Kaizen transformation takes place. How do my customers use my input? Company value = Price – Cost Waste increases cost and diminishes value. Therefore it is very important to focus on deletion, systematic improvement, value stream structure & pull based. Focus on MUDA: Any activity customer is not ‘Prepared’ to pay for! If you eliminate non value added activities the lead time will reduce and you will get higher flexibility, less stocks, better service, reduced complexity, less cost & improve freshness. Total system optimization: Stresses on integration of total system & appreciates all critical factors. 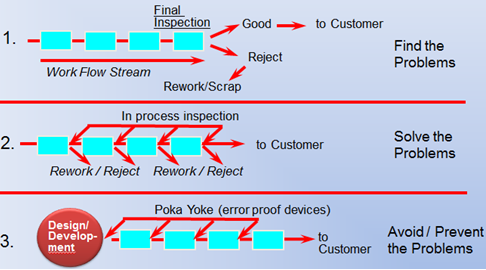 Pull means that no upstream should produce a good or service until the customer (downstream) asks for it. Provide clear objectives at all level. Coach and empower. Develop leadership. and the best improvement ideas will come from going to the gemba. an activity that takes management to the front lines to look for waste and opportunities to practice gemba kaizen, or practical shop floor improvement. 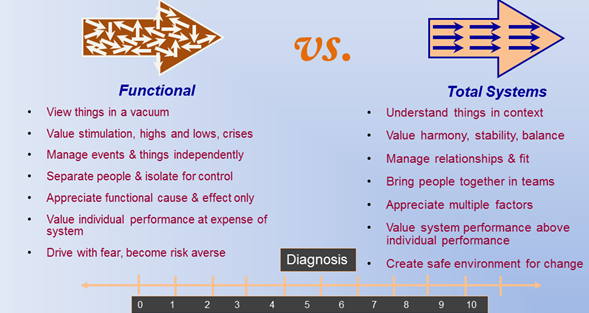 Categories: Article | Tags: 5S, Business excellence, Change management, Continual Improvement, Flow Management, Kaizen, Kaizen Awards, Kaizen College, Kaizen Consultants, Kaizen Institute, Kaizen Institute India, Kaizen Simulation games, Kaizen Tours, Kaizen training, Lean, Lean Awards, Lean Consultants, Lean Consulting, Lean Government, Lean Manufacturing, Lean six sigma, Lean Tours, Lean training, Manufacturing Excellence Awards, Muda, Mura, Muri, Operational Excellence, Operational Excellence Awards, People Excellence, Performance Improvement, Process Improvement, Six sigma, Six Sigma Consultants, World Class Manufacturing | Permalink. Kaizen college is the executive education & training arm of Kaizen Institute. It operates worldwide at different locations. We have announced these programs across three cities (Bengaluru, New Delhi and Vadodara) for the month of November. The objective of these programs is to support participants enhance their skill sets through contemporary practical learning experiences. Since its a small group training program, only a limited number of participants will be admitted on first come first serve basis. We may limit the number of participants from the same company if we receive more applications than the maximum number of participants. You can confirm your participation personally or nominate your representative/s for the program by sending the duly filled registration forms. A paradigm is a way of thinking (based on values and beliefs, and reinforced by standards, habits and results) which influences our way of interpreting a given situation or problem. When we react to a situation in a stereotyped or usual way this is called a paradigm.Each person reacts according to the paradigms adopted. Paradigms usually stands a long period of time until something occurs to bring into question the validity of the model. Change means “to cause to be different”. Change begins with acceptance. Set policy and results will follow! 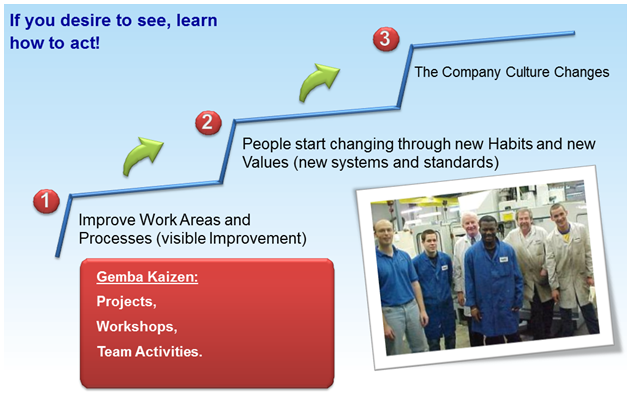 Train employees and Gemba improves! Rely on sophisticated tools instead of Gemba tools! Believes Gemba will ask “What is in it for me?”! Quality is quality manager’s job! Efficiency is industrial engineer’s job! Cost cutting, not cost management (muda elimination)! KAIZEN without focus and targets! Do not go to Gemba! “Slowest” Zebra, in order to SURVIVE.In the same jungle every morning…..….a zebra wakes up and thinks he has to RUN “Faster” than the “Fastest” Lion, in order to SURVIVE. How to change the company culture? Do 5S, SDCA and PDCA at all levels. 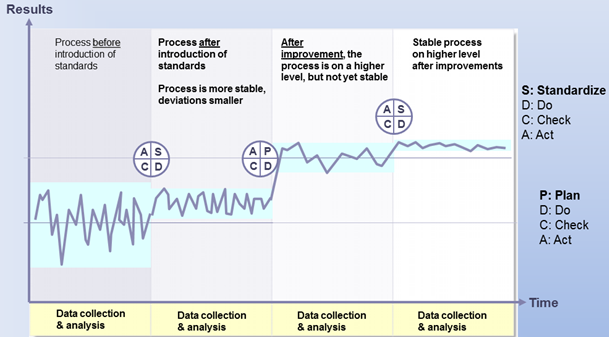 Continuous Gemba deployment (at the right speed of change). Continuous Education and Training (at the right speed of change). P.S. If your leaders and colleagues are also interested in this subject, do them a favor and share this link. They may thank you for your concern and initiative. Harish Hande doesn’t care about electrifying India, he wants the solar lamp to transform this country. Of course he was pleasantly surprised when newly appointed Prime Minister Narendra Modi said he would back the growth of solar power so that every household in India has at least one lamp by 2019, but Hande has also observed, for the last 15 years or so, that the ministry of new and renewable energy unfailingly gets a new secretary every six months. “Some don’t feel it’s an attractive post, some are quickly shifted, some retire,” he says with the air of a veteran who has figured out how to make things work despite policymakers. But these are all relatively minor niggles. 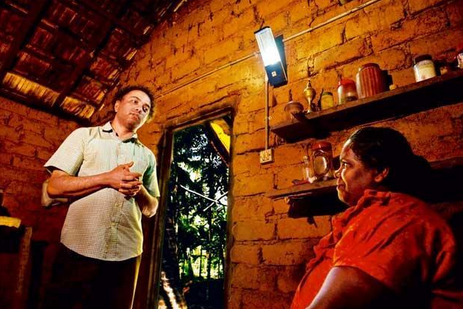 Hande, 47, won the Ramon Magsaysay Award in 2011 because the ideas at Selco (Solar Electric Light Company—India), the solar energy equipment supplier company he co-founded in 1994, shine brighter than the lights it sells to the poor. Take, for instance, Selco’s Light For Education project whose participants include around 30,000 children in Karnataka. Solar panels are installed on school premises and the battery, about the weight of a lunch box, is given to children. Children charge the batteries when they come to school. If they don’t come to school, there’s no light at home. “We stole the idea from the midday meals scheme,” says Hande. Stole and innovated. Or the way Selco tackled the unique problem faced by a community of poor drum-makers in Bangalore. They were willing to pay for solar power, but they had one condition. They were often evicted, with only 15-20 minutes to gather their belongings. Could Selco design a system they could run with? No problem, a design school graduate who works at Selco conjured up a solar system on a cart. Around 1.2 billion of the world’s population doesn’t have access to reliable electricity, and 400 million of these people live in India. Hande, who jokes that while growing up, his bread and butter came from a coal-fired plant in Rourkela (his father worked in power distribution at the Steel Authority of India), understood early that coal and gas wouldn’t be enough to meet India’s growing energy needs. Yet, as an energy engineering student at the Indian Institute of Technology, Kharagpur, and a doctoral student at the University of Massachusetts, US, Hande’s interest in solar was restricted to its supply security dynamic (the sun as a source of energy is limitless) and its environmental impact. Until a visit to the Dominican Republic in 1991 taught him a new lesson in thermodynamics. He saw the poor paying for solar lights and realized that renewable energy could be a catalyst for social change. So he spent the next two years in Sri Lanka and India—in darkness. He took time off to see how communities in both these countries lived without electricity. “I realized I didn’t know what happens after 6pm. We were just making decisions based on Excel sheets,” he says. He learnt a few things: The moment you don’t know a language (Sinhalese), the artificial hierarchies of a formal education crumble and you are treated like anyone else; none of his formal education was useful, except perhaps the confidence he had gained by living in a hostel. In Sri Lanka especially, communities came together after dark, usually in Buddhist temples, to vent their frustrations; in India, the lost time was usually spent in isolation and the kerosene lamp made people even more depressed. “It was my most efficient period of time, I joke,” he says. That’s also probably when he realized that the poor don’t want sympathy. They want partners and collaborators. At Selco at least, they try to break these barriers. Nearly 85% of Selco’s employees, including chief operating officer Mohan Hegde (a practising folk artist on weekends), come from rural India. Hegde and K. Revathi, president, have been running the company since 1 June when Hande retired as managing director to take charge of the Selco Foundation, the company’s think tank. All the brainstorming for solutions and innovations to help fight poverty takes place at the foundation. The business side executes the ideas and the company’s incubation cell teaches entrepreneurs how to replicate these successes across India (four projects are already under way in Manipur, Rajasthan, West Bengal and Madhya Pradesh; Selco is helping 25 more entrepreneurs raise funds). Formal qualifications are not a prerequisite for any job at Selco. Twenty-eight-year-old Raghu, who greets me when I arrive and gets us tea at the Selco office in Bangalore, started out as a driver and now handles administrative duties. “He’s going to be a branch manager by the time he’s 32. That’s our goal for him,” says Hande. In rural areas they joke about Selco’s hires: Are you part of the laptop or the non-laptop crowd? Hande sees the poor as asset creators, and not as a bottom of the pyramid sales opportunity. “Don’t sell to the poor. That’s our fundamental rule. And if you’re selling to the poor, make sure that the value you’re giving to the poor is much more than the monetary value they give you back,” he says. So when Selco representatives found that 32 Sidi families in rural Karnataka spent more money annually on candles, kerosene and to charge their mobile phones than it would cost to set up a simple solar system, they had to fix this. No bank was willing to lend the money to these families, so Selco offered a 100% guarantee on their behalf. Six months later, the bank reduced this guarantee to 20% as the payments were regular. “The best response was from the Sidis,” says Hande. “They said, light is great but once the solar loan is done, I will take a loan for a sewing machine.” They had become bankable. If there is a ranking of countries in respect of observance of STANDARDS of sanitation and hygiene, one can be sure that India would figure close to the bottom. Some time ago, a British MP, Lucy Ivimy, was reported to have said that Indians did not know how to dispose of their rubbish and are congenital litterbugs. “5S” is a reference to five words starting with letter S, for the basic elements of this system. Seiri (Sort), Seiton (Set in Order), Seiso (Shine), Seiketsu (Standardize) and Shitsuke (Self-discipline). One can also term these are 5 pillars of self organization or an effective workplace. We term it pillar because it supports the improvement structure. 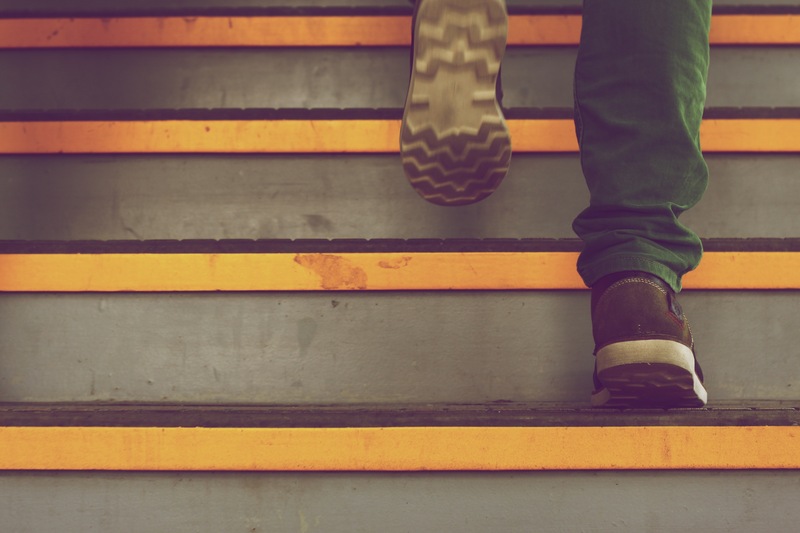 5S is the starting point for any Continuous Improvement initiative. It is the DNA. The 5S approach is universal and simple. The principle is same whether you apply this in a Foundry or in a Hospital. Without practising 5S, one cannot do quick changeovers, cannot maintain Just-in-time inventory system, or cannot practice Autonomous Maintenance. 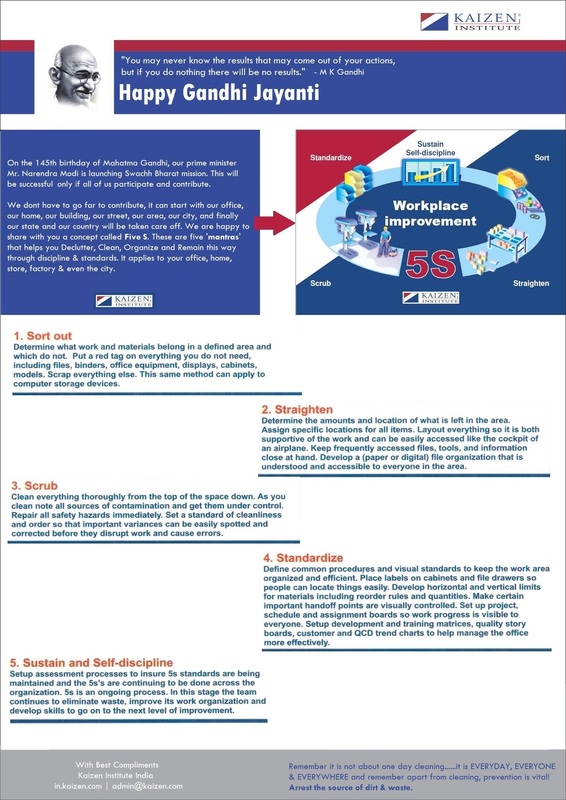 The general myth pertaining to 5S is that 5S is practised only to give a cosmetic up-lift to the workplace. 5S is more than a good looking place. With changing demands of customers, one is forced to find new ways to ensure survival. To do this, a change in the mind-set or shift in paradigm is essential. 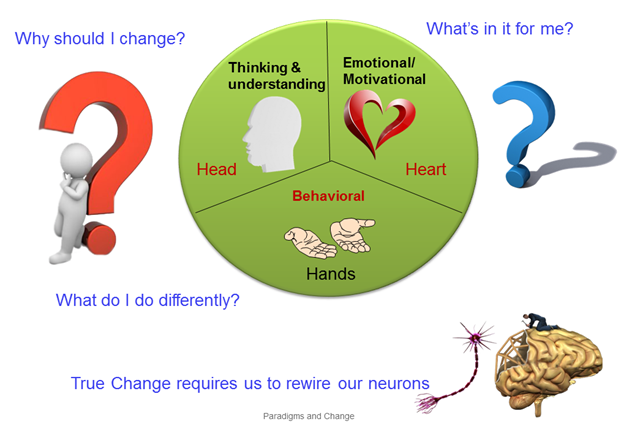 A change in mind-set is influenced by the change in the physical environment. 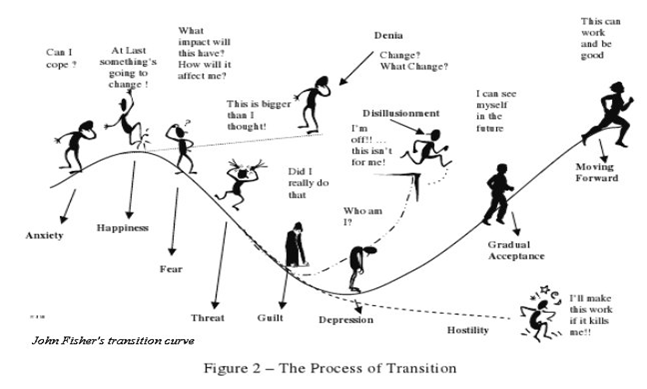 Thus, 5S facilitates the shift in the paradigms and paves way for improvement. 5S also creates an awareness of Non-value adding activities present in the processes. Another myth is 5S is a step-by-step methodology. But, this is not! All the 5 pillars are to be practised together and not in isolation. One can observe that the first 3 pillars are Gemba oriented. However, without Standardization and Self-discipline, no Continuous Improvement Initiative would sustain. Categories: Article | Tags: 5S, Business excellence, Change management, Clean India, Continual Improvement, Flow Management, Kaizen, Kaizen Awards, Kaizen College, Kaizen Consultants, Kaizen Institute, Kaizen Institute India, Kaizen Simulation games, Kaizen Tours, Kaizen training, Lean, Lean Awards, Lean Consultants, Lean Consulting, Lean Government, Lean Manufacturing, Lean six sigma, Lean Tours, Lean training, Manufacturing Excellence Awards, Muda, Mura, Muri, Narendra Modi, Operational Excellence, Operational Excellence Awards, People Excellence, Performance Improvement, Prime Minister, Process Improvement, Six sigma, Six Sigma Consultants, Swachh Bharat, World Class Manufacturing | Permalink. Essentially, the gift that fair process confers is trust and, hence, voluntary cooperation, a quality vital to the leader-follower relationship. Anyone who has ever worked in an organization understands how important trust is. If you trust the process and the people you work for, you’re willing to go the extra mile and give your best. If you don’t trust them, you’ll stick to the letter of the law that binds your contract with the organization and devote your energy to protecting your position and fighting over turf rather than to winning customers and creating value. Not only will your abilities be wasted, but they will often work against your organization’s performance. We never cease to be amazed by the talent and energy we see in the organizations we study. Sadly, we are equally amazed by how much of it is squandered by poor leadership. Blue ocean leadership can help put an end to that. The Leadership Canvases give people a concrete, visual framework in which they can surface and discuss the improvements leaders need to make. The fairness of the process makes the implementation and monitoring of those changes far easier than in traditional top-down approaches. Moreover, blue ocean leadership achieves a transformation with less time and effort, because leaders are not trying to alter who they are and break the habits of a lifetime. They are simply changing the tasks they carry out. Better yet, one of the strengths of blue ocean leadership is its scalability. You don’t have to wait for your company’s top leadership to launch this process. Whatever management level you belong to, you can awaken the sleeping potential of your people by taking them through the four steps. Are you ready to be a blue ocean leader? India has a great diversity in the maturity levels within different industries. There are certain industries which are mature and many are still at the stage where they are driving Operational Excellence (OE) in bits & pieces. In a way they are driving OE or continual improvements, but they are not really driving them in a way it should be. Too often the greatest challenge faced by the Operational Excellence Managers is “Sustaining Change”. This happens because of lack of focus on Daily Work Management practices or SDCA approach or misunderstandings or general resistance to change. It is not unusual for improvement efforts to disappear. Therefore sustaining change or operational excellence plays a crucial role in Continual Improvement journey. Leaders at every level in the organization must continue to demonstrate their commitment & visible leadership to sustain change so that whatever improvements happen do not disappear. 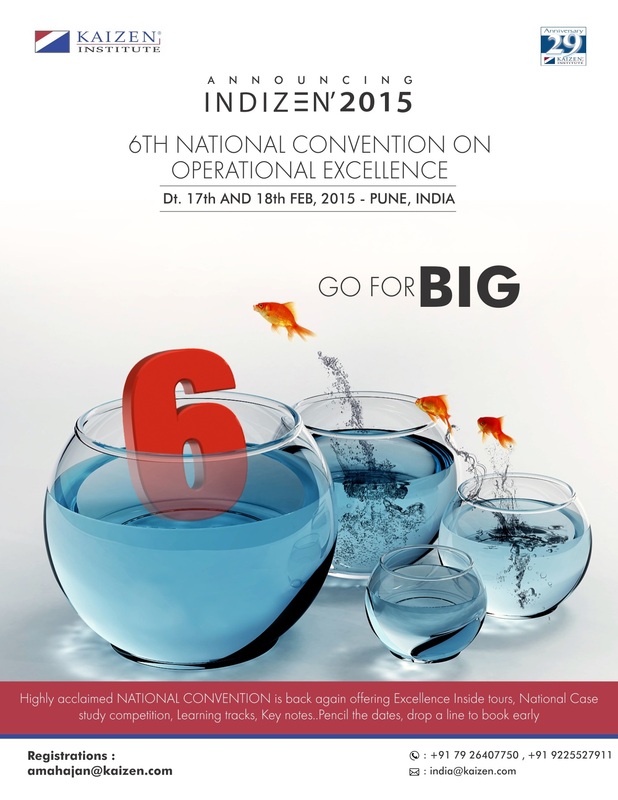 We present & invite you to IndiZEN 2015, 6th National Convention on Operational Excellence where you can Learn more about the “Sustained Operational Excellence – Key to Long Term Success of ‘Make In India”, Share your learnings & experience & Network with like minded people. IndiZEN 2015 is going to be the place to learn about the ways to sustain operational excellence. You will gain insights on how you can become an active learning organization and build the capability of your people by engaging their hearts & minds. Block your dates, be there to learn & find the real key to Sustainability. Categories: Article | Tags: 5S, Business excellence, Change management, Continual Improvement, Flow Management, IndiZen, Kaizen, Kaizen Awards, Kaizen College, Kaizen Consultants, Kaizen Institute, Kaizen Institute India, Kaizen Simulation games, Kaizen Tours, Kaizen training, Lean, Lean Awards, Lean Consultants, Lean Consulting, Lean Government, Lean Manufacturing, Lean six sigma, Lean Tours, Lean training, Manufacturing Excellence Awards, Muda, Mura, Muri, Operational Excellence, Operational Excellence Awards, People Excellence, Performance Improvement, Process Improvement, Six sigma, Six Sigma Consultants, World Class Manufacturing | Permalink.